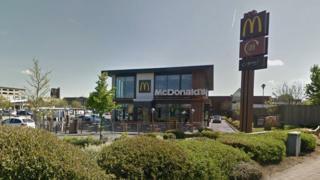 Two men and a woman have been arrested following an armed robbery at a McDonalds restaurant in Merseyside. Two men armed with knives threatened staff at the restaurant on Chalon Way West, St Helens, before stealing a large amount of money just before 03:00 BST on Thursday, police said. Two men, aged 31 and 47, were arrested on suspicion of robbery and later released under investigation. A woman, 44, also held on suspicion of robbery, was released on bail. Merseyside Police said inquiries were ongoing.